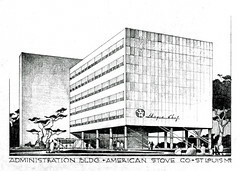 Armstrong developed this perspective rendering of the Magic Chef Building in early 1946 to present the design to the American Stove Company executives and for publicity purposes. This version of the drawing is substantially the same image printed in the St. Louis Globe-Democrat in February 1946, except the logo and lettering location and size were revised. The Magic Chef text and logo are here shown at the bottom left of the east elevation of the building. The logo had previously been shown across the top of the wall. That earlier location is just barely visible here, having been whited out and sketched over. It's interesting to compare this perspective drawing with photographs taken of the building following completion. Initially, the rendering seems low and squat (as if the height of the building was increased). However, the number of floors is correct. I believe the perspective was drawn accurately, but that the viewpoint taken was rather far away. The photographs were taken from a much closer location with a wide angle lens (wider than the human eye's cone of vision). The distortion in the photographs enhances the height and makes the building appear more dramatic (and with better proportions). Image courtesy of the Harris Armstrong Archives, Special Collections, Washington University in Saint Louis.